Three cards today to finish off my Authentique devoted series which got interrupted due to more pressing christmas cards! 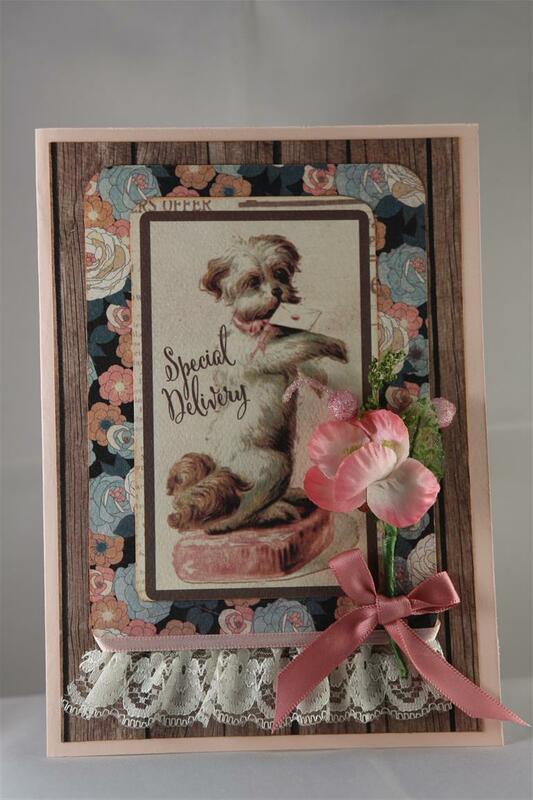 I had a bit of fun with these cards and used plenty of lace, ribbon, hessian, bling and even a button. I did go to the specialist yesterday, and found out I have torn a ligament in the back of my knee, so operation on Thursday and after that I may be missing from here for a few days while I recuperate, but until then…til tomorrow….. Yesterday was one of my sisters’ birthday and this is the card i made for her as she has a little dog the same as this one! The paper is a new collection from Authentique ( love the feel and quality of this companys paper) and I just did lots of layering, corner rounding, inking of edges, and added ribbon, lace and a prima flower spray. The cardstock is from stampin up.I am off today to teach a class, looking forward to seeing my ladies. it’s going to be a hot day here today.. we seem to have skipped spring and headed straight into summer this year! Til tomorrow…..